Last week, we asked whether your association has the CIO mindset. We advocated for a shift from operational thinking to strategic thinking. A report from CIO.com shows that many CIOs are struggling with this transition. Sometimes, IT staffers are so entrenched in their job description that they simply need outside help to raise the technology discussion to a higher level. Let’s take a look at the state of the CIO—not just in the nonprofit world, but across industries. The CIO’s job is getting harder. The CIO is increasingly more important to business strategy. 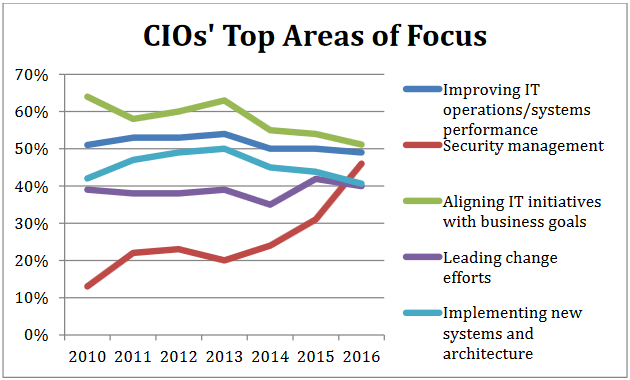 Nearly 1/2 of the CIOs surveyed report directly to the CIO. Strategic CIOs earn more than functional CIOs. Cybersecurity is a rapidly increasing and complicated focus of CIOs. CIOs are still more likely than other C-suite leaders to be concerned about security—but the gap is narrowing. Strategic CIOs experience fewer hurdles while transforming their business. Where IT is seen as a cost center, CIOs control less of the IT spending. CIOs need to collaborate with business leaders to influence strategy and transformation—and to control their own budgets. Digital revenue streams are growing—and strategic CIOs are leading the charge. Marketing has its own IT budget in 1/3 of companies. Strategic CIOs have more input and rising collaboration with marketing than functional CIOs. The CIO landscape is changing, and associations need to take notice. Regardless of size or mission, every organization needs someone who’s thinking and acting like a CIO—their title is unimportant, but their role is critical. Looking for more information? We've got you covered. Take our quiz, Is It Time for Your Organization to Start Thinking Strategically About Technology, today!